Rail Yard Dawgs home this weekend before long road trip. 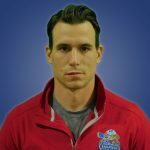 The Roanoke Rail Yard Dawgs are in the middle of a six-game home stand before they head out on the road for almost a month. Tonight and tomorrow the SPHL’s second-ranked team – the Birmingham Bulls – are in town. More on that and other topics from Dawgs head coach Dan Bremner.